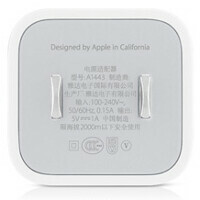 Following two tragic events in China that left a 23 year old flight attendant dead and a 30 year old man in a coma, Apple is warning those in China to use only official Apple chargers. The Cupertino based company has added content to its Chinese website that shows how its customers in the country can make sure that the equipment they are using is an official Apple product. Apple was rushed into taking action after word reached the U.S. earlier this month about the electrocution of Ma Ai Lun. The 23 year old, who was supposed to be married on August 8th, was shocked while answering a call on her Apple iPhone 5 which was recharging at the time. The adapter plugged into the wall was not official Apple equipment. The second case in China involved 30 year old Wu Jiantong who was shocked by his Apple iPhone 4 while connecting it to a charger. He has been in a coma ever since. And problems with third party equipment isn't limited to Apple. You might remember Fanny Schlatter, the 18 year old whose Samsung Galaxy S III exploded in her pants, causing third degree burns on her thigh. As it turned out, an unauthorized third party battery was at fault. Always use approved chargers and batteries. It's simply safer. I agree. Better to pay more for something that's approved and less likely to damage and cause an issue over using a cheap knockoff that's not approved. Exactly, my old iPhone 3G had the charging port burned out by a third party car charger in 09'. Apple being apple replaced it for me at no cost. If you told them it was a third party charger they wouldn't of fixed it for free. Of course it is. however, Apple designed the charger cable to have a USB connector on it, so it's impossible for them to think that people will not use other wall warts with the charger cable. I sure hope Apple is at least looking into this and looking to make design changes if necessary to prevent this from happening if users choose to use other USB wall warts. It's pretty sad if Apple takes the stance "well use the approved charger". Pretty irresponsible engineering if you ask me. If truly, the risk is DEATH if you don't use the correct wall wart, then Apple needs to re-design the cable so the wall wart is built into the cable, so you can't use others. Sad. The issue arises from good 3rd party accessories and POS ones. Apple is only going to accept responsibility for what they make, not somebody else. Perfectly reasonable. I don't think anybody wants to take that step back to non-modular chargers. You can blame the EU too. Wikipedia has an article on the "Common External Power Supply". This is not just Apple. Most all manufacturers do the same thing including Samsung and HTC. Or be like me and know where to buy the exact thing for a lot less. It would be nice if they wouldn't overinflate the price on "official" accessories. That is just how they roll. Their whole business revolves around overinflating prices and marketing it like they are giving their customers value. When in reality, there is no bigger rip off right now than Apple products. Apple is a for profit company, what do you expect? I hope you didn't think buying an Apple, Samsung, or HTC product or accessory meant that they were looking to give you Walmart brand store prices. Samsung charges $60 for a flip cover with a little plastic window and you say Apple is the biggest ripoff? That's hilarious. Actually official accessories aren't even that expensive. Compared to what? if you work for the government.. then I suppose not. Apple charges $30 for every accessory they have. Of you have a Retina MBP, you're looking at an extra $150 alone for adaptors and such to hook it up to a display and play CDs/DVDs. $30 for a lightning cable. Lol. Confirmed dumb. http://www.samsung.com/us/mobile/cell-phones-accessories/ETA-U90JWEBXAR What is your point again? Stop posting for today and come back again tomorrow. Confirmed dumb troll. $24.99 http://www.samsung.com/us/mobile/cell-phones-accessories/ETA0U60JBEGSTA You chose the most expensive charger when in real life the average Joe is going to pick the cheaper one. $24.99, $34.99 and $39.99. What was your point? Do yourself a favor and log off and go outside. Thanks. My job here is done. You should have taken my advise :( I just LOL @blind haters that doesn't know any better. Here's how they think: Apple's usb cable = $40 Samsung's usb cable = $40 OMFG Apple's expensive!!! Apple! Apple! Everybody tweet #Notsureifseriousorjustdumb or #Notsureiftrollorjustdumb for PapaSmurf and Ninetysix lol. Seriously you guys' conversation was hilarious.